Spring is here finally! If I were to “roll call” all you readers, where would you be located? Here in Chicago, it was a gorgeous week. The weather warmed up and my spring gardening has begun. And by “begun” I just mean all the weeds are pulled and the beds are ready for planting! Things don’t usually get in the ground here until Mother’s Day weekend. That’s when we plant our vegetable gardens, assemble all our flower pots, and get the annuals in the beds! And pray that there is no late frost! I’m not one to want the big brunches and fancy dinners for Mother’s Day. Especially if we’ve been working in the yard all day. However, I am never one to turn away from a delicious dessert. Today I have the mac-daddy of all desserts! If you’ve been trying to find a way to impress that mother in law of yours, I’ve got you covered today! From the homemade layers of chocolate cake to the luscious peanut butter cheesecake, who could resist this stunning masterpiece? Today’s cake is covered in a thick layer of creamy peanut butter frosting and a dark chocolate ganache. I’ve teamed up with DOVE® Chocolate to create a few recipes this year! Did you know that you can melt down their creamy chocolate and make the most rich and decadent ganache? Mom deserves the BEST, and this cake delivers! First start by making the cheesecake. Preheat oven to 325°F. Using a large, shallow roasting pan, fill with about 1 inch of water and place on bottom rack of oven. Place a circle of parchment paper in bottom of 9-inch springform pan. Set aside. In a large mixing bowl, beat cream cheese with granulated sugar for 2-3 minutes until creamy. Add in peanut butter, salt, and eggs. Beat well. Beat in sour cream and heavy cream, scraping down sides of the bowl as needed. Allow to mix on high for two minutes until thick and creamy. Pour into prepared springform pan and place in bottom 2/3 of oven (one rack above the roasting pan). Bake cheesecake for 45 minutes. Turn oven off and let cheesecake sit in oven for an additional 25-30 minutes. Remove from oven and cool completely on wire rack. Once cooled, refrigerate (in pan) until ready to use. Or, remove from pan and freeze until later use (thaw in refrigerator if frozen). Spray two 9-inch cake pans with baking spray. Set aside. Preheat oven to 350°F. In a bowl, combine the flour, cocoa, salt, baking soda and baking powder. Set aside. In a measuring cup, combine cooled coffee with milk*. Set aside. In a large mixing bowl, beat butter and sugar for 5 minutes with an electric mixer. Beat in eggs, one at a time. Slowly add in dry ingredients and alternate with the coffee/milk mixture (about 3 additions of each). Once all the ingredients are added, beat cake mixture for about 2-3 minutes until fluffy (scraping down the sides of the bowl as needed). Divide cake batter into the two cake pans. Bake in oven for 25 minutes. Remove and allow to cool about 10 minutes in pan. Invert on a wire rack and cool completely. Beat butter for about 3 minutes in an electric mixer until pale in color, scraping down the sides of the bowl as needed. Add in peanut butter, sugar, and milk. Beat an additional 3-5 minutes until frosting is fluffy and well blended. Reserve about 1 1/2 cups of frosting for the garnish and spoon into a decorator bag with tip. Set aside. Unwrap 15 Dove® Dark Chocolate PROMISES and place in a microwave safe glass bowl. Add the cream and microwave for 30 seconds. Stir and heat for an additional 30 seconds. Using a whisk, quickly stir this until it’s smooth. Set aside and allow to cool for about 15 minutes. You can do this while you refrigerate the frosted cake. On a cake platter, place one layer of chocolate cake. Add the cheesecake on top of that (be sure to remove parchment paper!) and top with your second layer of chocolate cake. If needed, trim the edges to make sure they are all the same size. 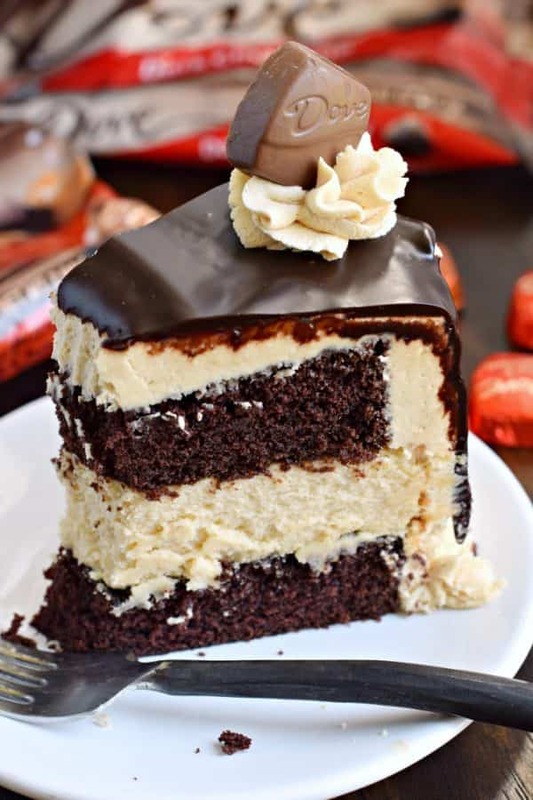 Spread peanut butter frosting on the sides and top of cake in a thick layer. Refrigerate cake for about 15 minutes while you prepare the ganache. Pour cooled ganache over the center of the cake and smooth out to the edges, allow the ganache to drip down the sides of the cake. 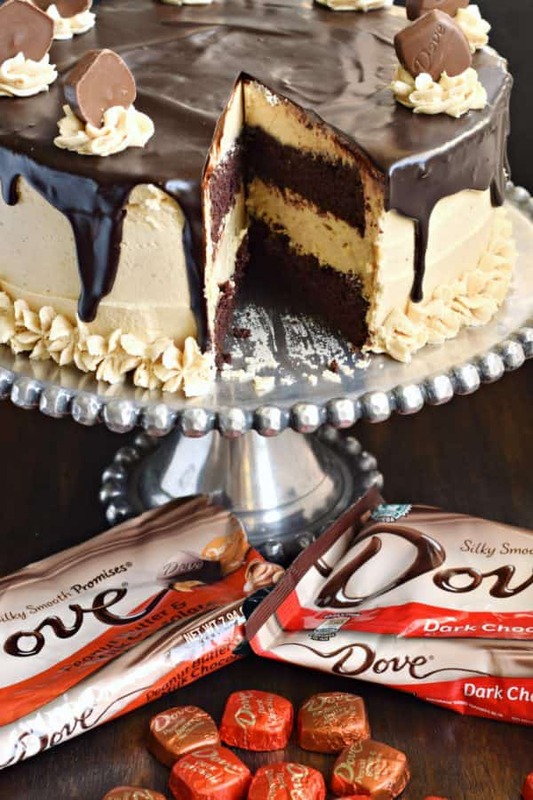 Using your reserved frosting, pipe a few swirls to the top of the cake and add your unwrapped Dove® Peanut Butter and Milk Chocolate PROMISES. You can also pipe some stars of frosting to the bottom edge of the cake. ENJOY. Keep cake refrigerated until ready to enjoy! Read the directions carefully before starting. If you’re making it the same day, start early, as you want to give the cheesecake time to chill and set. If you have time…I suggest making the cheesecake the day before and refrigerating it until you’re ready to assemble the cake. You can even make it days in advance and freeze the cheesecake! You will want to use the same size cake pans as your springform pan for the cheesecake. Otherwise, you’ll be doing some “shaving” of one of the cakes to make them equal. I used 9-inch cake pans and a 9-inch springform pan. If you absolutely must, you can substitute your favorite boxed chocolate cake mix. However, once you try a homemade, from scratch, recipe…you may never go back! TRY IT. Don’t be afraid to use the coffee in the cake recipe. It doesn’t make your chocolate cake TASTE like coffee…it just gives the cake a deep, rich, fudgy flavor. Trust me. When baking the cheesecake, I put a large 15x12x2-inch broiler pan in the bottom of my oven with about an inch of water. I place this on the bottom rack while my oven preheats (and keep it in there the entire time). I then place my cheesecake in the springform pan on the next shelf up (still in the lower 2/3 of my oven). The moisture from the water helps prevent cracking in the cheesecake, and also results in a very moist cheesecake! Once your cheesecake is done baking, turn your oven off and leave the cheesecake in there for about 25-30 minutes. This completes the baking process, and also helps reduce cracks. For the frosting, you will want to beat your butter for about 3 minutes with an electric mixer, until it’s very pale in color. THEN add your remaining ingredients and beat an additional 3-5 minutes, scraping down the sides of the bowl as needed. This is a very smooth, rich and thick frosting. I reserved about 1 1/2 cups to use for garnishing at the end. Place this in your decorating bag with tip and set aside. The ganache on this cake is truly the masterpiece. It’s what makes this cake go from delicious to extraordinary! I used DOVE® Dark Chocolate PROMISES. 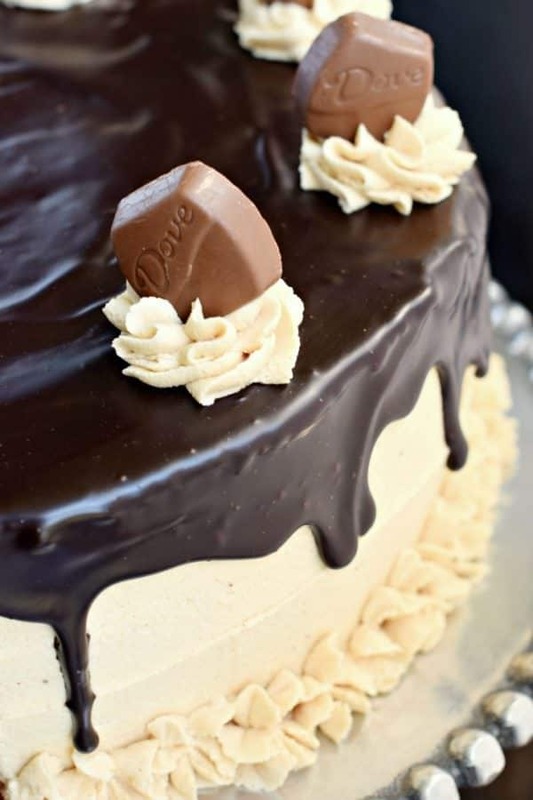 Use your remaining frosting to decorate and add some DOVE® Peanut Butter and Milk Chocolate PROMISES to the top of the cake! Keep the cake refrigerated until ready to serve. Then dig in, my friends! Happy Mother’s Day to all you moms out there. What you do each day is hard work and deserves to be recognized. I wish I could share this cake with all of you, but you’ll just have to make one for yourself. It’s worth it, I promise. I DOVE® PROMISE, hahahaha!!! Two layers of homemade spice cake with an eggnog cheesecake filling. 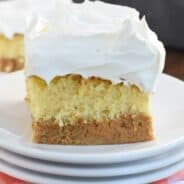 This Eggnog Cheesecake Cake is topped with a creamy eggnog buttercream frosting! If you’re looking for a delicious dessert, give this Cinnamon Roll Cheesecake Cake a try! Layers of homemade cinnamon cake and cinnamon cheesecake topped with a sweet, cinnamon frosting! 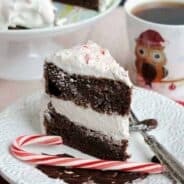 Chocolate Peppermint Cheesecake Cake: double chocolate layer cake with peppermint cheesecake center and peppermint frosting!! 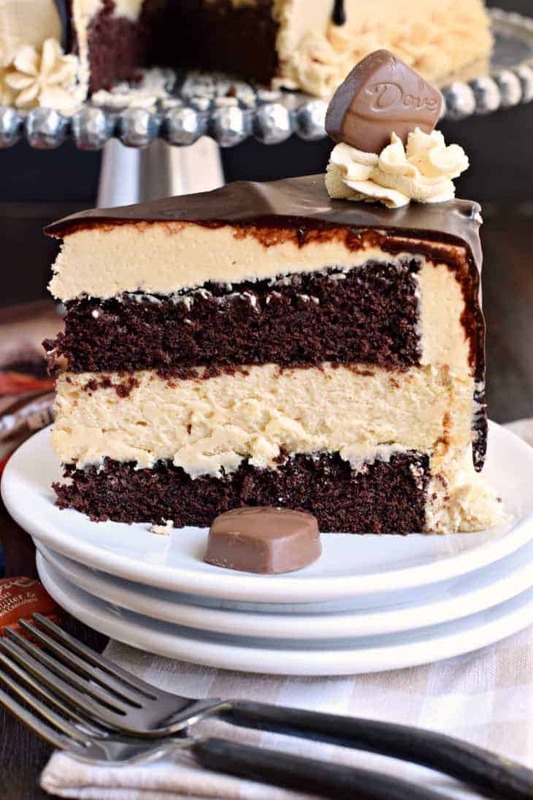 What's not to love about this Chocolate Peanut Butter Cheesecake Cake? 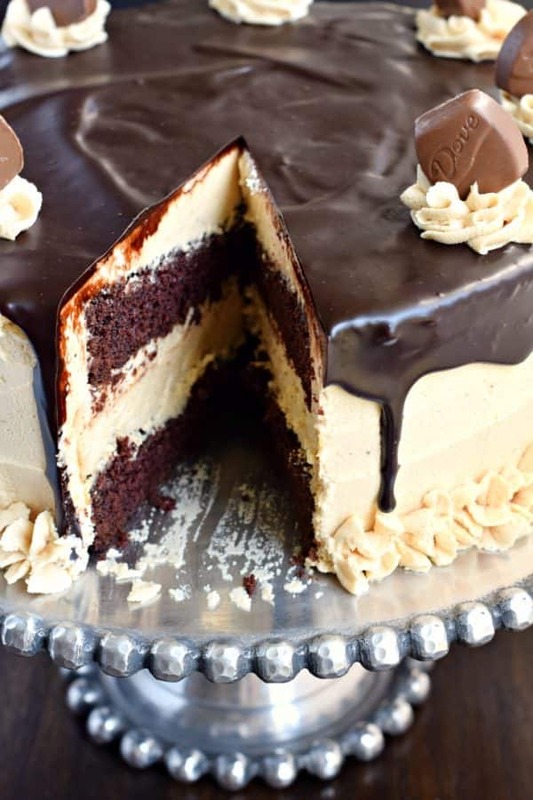 This stunning cake has layers of homemade chocolate cake and peanut butter cheesecake. 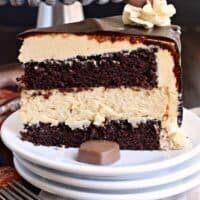 Topped with a creamy peanut butter frosting and dark chocolate ganache, this cake is sure to satisfy that sweet tooth! Preheat oven to 325°F. Using a large, shallow roasting pan, fill with about 1 inch of water and place on bottom rack of oven. Beat in sour cream and heavy cream, scraping down sides of the bowl as needed. Allow to mix on high for two minutes until thick and creamy. Pour into prepared springform pan and place in bottom 2/3 of oven (one rack above the roasting pan). Bake cheesecake for 45 minutes. Turn oven off and let cheesecake sit in oven for an additional 25-30 minutes. Remove from oven and cool completely on wire rack. Once cooled, refrigerate (in pan) until ready to use. Or, remove from pan and freeze until later use (thaw in refrigerator if frozen). Unwrap 15 Dove® Dark Chocolate PROMISES and place in a microwave safe glass bowl. Add the cream and microwave for 30 seconds. Stir and heat for an additional 30 seconds. Using a whisk, quickly stir this until it's smooth. WHAT HAVE YOU DONE?! Seriously. This cake. AIMEE! Okay, I’ll stop screaming in caps. But it’s the best thing I’ve ever seen in my whole life. I just need a way to teleport it to DC. Can we work on that? It’s gorgeous, and PB and chocolate is my favorite combo in the entire world. I legit don’t think you could make anything more delicious than this! Chocolate, peanut butter, cheesecake and cake?! This has it ALLLLLLLL! Pinned! Ok, this is heaven right here!! Love this gorgeous cake with all of my favorite ingredients!! Anything with chocolate and peanut butter makes me extremely happy! Now that’s one decadent looking cake! I would gladly do yard work if that was waiting for me to dig into afterwards!!!! Love it girl!!! I read this after a day of gardening, and I am warn out. We worked last weekend and this weekend and finished today. Wishing I had this cake right about now! 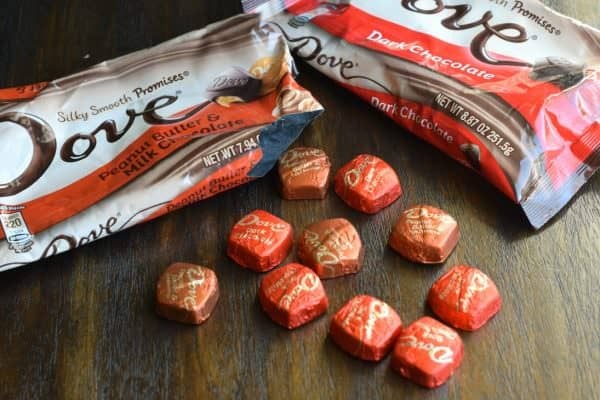 We are HUGE Dove chocolate fans! I love their dark chocolate!!! This cake is fantastic! Happy Mother’s Day 🙂 May the fork be with you! I LOVE those dove chocolates! I bought a bag of those exact ones and they were gone so quickly 🙂 Pinning! Crikey! I feel like I have a contact sugar high just from looking at the pictures…and I like how it feels. WOW! It’s not for the faint, haha!! This cake is absolutely gorgeous, Aimee! I don’t think I’ve ever had a mashup of cake AND cheesecake before. I love the DOVE chocolate and peanut butter, too. Just perfect! Oh my gosh, I first had a cake/cheesecake at the Cheesecake Factory years ago. Been obsessed ever since! This mamma definitely wants this for Mother’s Day, it really is the mac-daddy of desserts! That filling is incredible! Wow! What mother wouldn’t love this for mother’s day! Oh yum, this sounds delicious! And love your photos, by the way ???? This cake looks soooo delicious. Have a question can I substitute gluten free all purpose flour for regular flour? I’m not good with gluten free substitutions, so if you’ve done it before successfully, let me know! I’m in Australia , should I just use normal cups here? This is a dumb question. Do you put BOTH of the cheesecakes on the middle then top with second layer of cake? Hi there. I am in the process of making this recipe. Just have one question, can I freeze the whole cake for 5 days. I would freeze the layers separately, then assemble with fresh frosting on the day you serve! I really want to make this cake right but my cheesecake ended up with a huge crack in the middle and too soft to the touch what am i doing wrong? I followed your instructions carefully. This looks absolutely delicious! My question is: how do you remove cheesecake from pan and place it on the cake without breaking the cheesecake up (and getting the paper off the bottom)? I have a lot of leftover frosting. Can I freeze it and if so, for how long? Hate to bring this up but what are the nutritional values per serving? 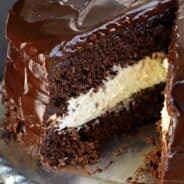 Can whip cream frosting be substituted for the butter cream? Will it hold up to the cooled granache? Is it okay to exclude peanut butter from the cheesecake recipe? Different brands of peanut butter can result in different results. I never use natural peanut butters for this reason. I use Jif or Skippy. If it’s not your peanut butter then I’m not sure why your frosting is too thin…. I was wondering what I could use instead of peanut butter. Sorry, it looks delicious,but I can’t have peanuts. You could use Biscoff, it’s a great alternative to peanut butter! The PB frosting is the BEST! My frosting hating kid liked it, it was not too sweet for him. My family liked this cake. My PB hating spouse would not try. It was very rich and the small slice I gave out was too much for some. I did not add coffee, I doubled the milk.